If O'Neill is looking for a poacher, what about the Championship's top scorer? The Nottingham Forest attacker is in terrific form. 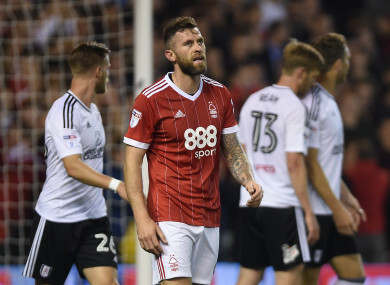 NOTTINGHAM FOREST MAY have lost to Fulham in their Championship clash on Tuesday night but striker Daryl Murphy grabbed his sixth of the campaign, bringing him joint-top of the goalscoring standings. At a time when Republic of Ireland boss Martin O’Neill is bemoaning the fact that his side no longer have a player who can score regularly, the 34-year-old Waterford native is consistently doing the business for his team. With Jonathan Walters ruled out of the the remaining two World Cup qualifiers, it surely opens the door for the in-form Murphy to possibly get a chance against Moldova and Wales. It’s not a long-term solution, certainly, but with Shane Long having not found the back of the net since February, perhaps Murphy is deserving of a start given how well he’s performing this season. In a division suddenly littered with £10m strikers, Nottingham Forest have the Championship's top scorer. Daryl Murphy cost £2m. Murphy has been a late developer in terms of his goalscoring and only really blossomed during his time with Ipswich, where he was was between 2013 and 2016. Even his time with Newcastle last term saw him do well when he was given a chance. In nine starts under Rafael Benitez he managed six goals – five of those in the Championship. He may not be the most flexible or high-profile forward but, right now, he’s the Irish attacker most likely to score goals. With the Irish side needing to win both remaining games to have a chance of reaching the World Cup, that’s precisely what they need. Email “If O'Neill is looking for a poacher, what about the Championship's top scorer? ”. Feedback on “If O'Neill is looking for a poacher, what about the Championship's top scorer? ”.